Overview: There are over 1500 species of Begonia. These plants are mostly found in tropical and sub-tropical areas like Southern Asia and Africa. Begonias come in a variety of colors. The flowers are found in the shades of white, pink and red while the leaves are found to be bright green to bronze. The flowers of this species can frequently be hybridized with each other, and this has led to an enormous number of cultivars. Begonias are found in a baffling range of flowering plant collections. Some flower during the autumn and are grown in big gardens. Others have beautiful foliage. Begonias are sensitive little flowers which can not do well in absence of fertile, rich soil and proper, ample sunbeams. History: Historical documents show that the genus that was later called Begonia had already been discovered in the past. Back then, they were classified under different names. It has been known that these plants were described in the Chinese writings back into the 14th century. The term "Begonia" was coined by a Franciscan Monk and botanist. In 1960 he discovered six plants which belonged to no genus at that time. He dedicated his invention to his patron, Michel Begon, hence the genus name, Begonia. Begon had a prodigious interest in botany and during that time he was at that time the Governor of Haiti. Why Begonia is special: Hardy any plants can match up to the Begonia for long-lasting color, fair drought tolerance and memorable impact when used in mass plantings. They appear to be in colorful even without the flower blooming. They are found in a wide array of very attractive colors. The leaves of this plant are very elegant with their marked, large and asymmetric leaves Moreover, it comparatively very easy to grow a Begonia. These characteristics make Begonia one of the most popular and sought after plant for decorative purpose. Therefore these plants are found to be creatively used in many places like office buildings, malls and offices Appearance: The appearance of Begonia is quite similar to that of roses. Their rich, attractive colors automatically upgrade the garden, patio or flower boxes. Begonias are found to include a wide variety of colors like pink, yellow, salmon, red and white. Generally, they are 6 to 9 inches tall. However, some plants grow as tall as 12 feet tall. Their leaves are very large, attractive and asymmetric. Types: Begonia contains more than 1500 types of flowering plants. These flowering plants are known to display a mystifying range of hues, stalks, leaves and bud sizes. The garden form of these plants is divided into eight different categories in the garden form. Are known as thick stemmed, Semperflorens, Rhizomatous, Rex-cultorumthey, Tuberous and Trailing scan dent. One variety of begonia called the Rex are little and petite. Some variety belonging to Begonia have long, winding, dense and swollen stalks which make masterpieces as the center of the garden. 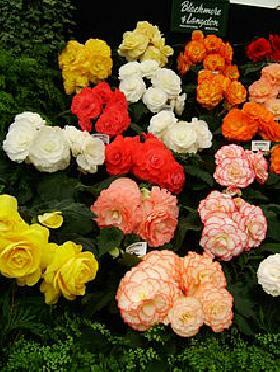 The tuberous type of begonia is also very popular around the world as a bedding plant and also as a greenhouse plant. In some countries such as England it is the main type grown. The flower size can range from small, 1/2 inch flowers, to the large exhibition types that can have flowers the size of dinner plates. Cane-like begonias have been popular plants for many years and were known as "angel wing". Cultivation: Wax Begonia and other begonias are cultivated as annual plants for summer flower beds, containers and hanging baskets Begonia is very simple to raise and take care of. They bud in all kinds of degrees of sunlight, high or medium. However, they blossom best in partial sunlight. Productive and lush soil works best for these plants. Begonia is usually grown outdoors. However, they make perfect houseplants, flowering nearly continuously in the right conditions. Some of the fibrous rooted types like wax- leafed don't even need to be in bloom to be color. Indoor Cultivation: The Begonia plants need a little more sunlight when grown outside than on outside. They have to be kept near a sunny window for maximum blooming. These flowers should be watered by allowing the surface of the soil to dry out between consecutive watering. Fertilizers should be added to the plant every 3-4 weeks to keep the flowers thriving. If the plant grows gangly, they are to cut. Begonias prefer cooler temperatures but if the temperature is very low, it will not bloom. Outdoor Cultivation: The Begonias bought in pots should be planted outdoor once the danger of frosting is passed away. Begonias blossom efficiently in partial sunlight and should be planted with a gap of 9-10 inches between each consecutive plant. Tuberous Begonias should be planted with the concave side of the tuber facing upward. They should be planted six inches apart, two inches deep. Once the plant starts to yellow the tuber should be dug and taken out of the soil and stored in sand, in cool temperature. Time Structure: Some types of begonias remain evergreen throughout the year. These plants grow in all seasons. However, the decrease in temperature or light intensity may reduce the growth of these plants. To ensure high rate of plant growth they should be kept in warm weather, moist but well-drained soils and moderate humidity. If never plagued by frosty or subfreezing temperatures, begonias persist as evergreen plants, displaying fleshy stems, asymmetrical leaves and waxy flowers. Cold kills begonias. Caution: Though compared to other plants Begonia faces less diseases, it is still vulnerable to a number of diseases. These flowers seem to be very prone to pests. The general flies and insects that bother these plants are slogger and germs. Dip a cotton ball in alcohol and touch each insect with it. For red spiders, dust with sulphur. With vigilance and care these pests can be avoided. In addition, other problems like stem rot. Pytium decay also come into scene. Begonia diseases are sprout falls and top crusts. Care: Begonia has its origins in tropical areas like southern Asia and Africa. These places are hot. Thus Begonias can not withstand low temperatures. Therefore they need to be taken care of during winter. They have to be stored inside the house in the course of cold. Once the leaves of the bush change its color as it begins to fade, it should not be watered anymore. Once the plant begins to exhibit inactivity, the plants should be pulled out of the mud. The whole plant has to be dug out at once. They should now be brought inside the house. Mealy bugs can be avoided by the use of alcohol. When a cotton ball dipped in alcohol is made to come in contact with the bugs, the bugs begin to break down or move away from the plant. Sulfur dust works best to avoid red spiders.